Retroperitoneal oblique approach to lumbar spine used surgical corridor between psoas muscle and aorta for exposure to anterior part of lumbar spine. Lumbar sympathetic chain (LSC) runs in the corridor to make it a structure at risk of injury. 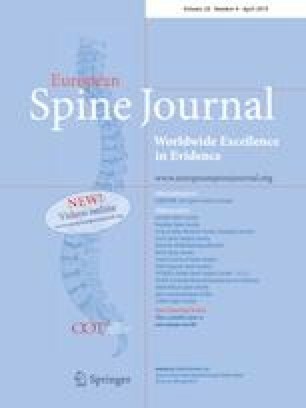 Does LSC relationship with surgical corridor for minimally invasive retroperitoneal anterolateral oblique approach change in different intervertebral disc level? Left LSC was identified in axial magnetic resonance imaging images at L2–3, L3–4 and L4–5 intervertebral disc levels of 144 patients. Distances between LSC and left psoas muscle and aorta were recorded. Mean age of the patients was 62.3 years. LSC was identifiable in 90.9% of levels. Distance between LSC and psoas muscle at L2–3, L3–4 and L4–5 was 4.0 mm, 4.7 mm and 5.2 mm. Statistical difference was found between L2–3 and L4–5 level (p = 0.006). Distance between LSC and aorta at each level was 12.4 mm, 12.3 mm and 10.6 mm without statistical difference. In non-scoliosis group distance between LSC and psoas muscle at each level was 3.1 mm, 3.3 mm and 4.0 mm. Statistical difference was found between L2–3 and L4–5 level (p = 0.012) and between L3–4 and L4–5 level (p = 0.041). Distance between LSC and aorta at each level was 11.9 mm, 11.4 mm and 10.2 mm. Statistical difference was found between L2–3 and L4–5 disc level (p = 0.039). LSC moves away from psoas muscle and becomes closer to aorta in L4–5 disc level. The online version of this article ( https://doi.org/10.1007/s00586-018-5779-6) contains supplementary material, which is available to authorized users. W. Limthongkul is a consultant for Medtronic. There is no funding or grants related to this research.